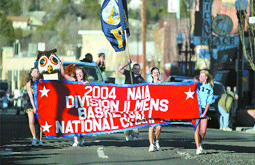 OIT cheerleaders lead a parade through downtown Klamath Falls Thursday in celebration of the school's first NAIA Division II men's basketball national championship. Oregon Tech's championship team enjoyed the icing on the cake Thursday at Danny Miles Court. Following a parade through downtown Klamath Falls, more than 1,200 supportive fans gathered in the gym and roared their approval of the Hustlin' Owls during a celebration of the team's triumph in the NAIA Division II national tournament earlier this week. "The last couple hours have been the icing on the cake, for sure," said senior Matt Johnson, a Henley graduate, as he took a break from signing autographs. 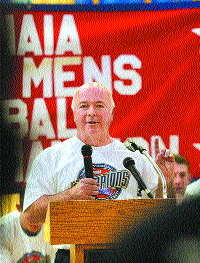 Coach Danny Miles speaks to students and fans during a celebration at Danny Miles Court. "We didn't think it could get any better than when we won the championship," he said. "Klamath Falls proved us wrong with the huge parade, and then this." OIT won the national title Tuesday with a 81-72 victory over Bellevue University of Nebraska. The final celebration with what Coach Danny Miles has repeatedly called the greatest fans anywhere started with the parade down Main Street that included cheerleaders, a band and the championship banner. OIT senior Bryan Quinn, who recently won the NAIA national indoor pole vault championship, also was part of the parade and celebration (see story page B1). OIT's Todd Matthews, left, and Kevin Baker flash the No. 1 sign during Thursday's parade. Baker won the tournament's Most Valuable Player award. Then, as the song "We are the Champions" echoed throughout the gym, the Owls entered their home court to a loud and boisterous standing ovation. Proclamations were read, stories shared and thank-yous handed out, after which fans mingled with players, and sought autographs on team photographs and a variety of T-shirts. "We just have wonderful, wonderful fans," said senior Kevin Baker, who won the tournament's Most Valuable Player award. "These are some great people, and I'm glad to be part of it." "It's just awesome to see all the fans, and it's nice to be able to come home to something like this," said junior Michael Nunes, another Henley grad. OIT President Martha Anne Dow started the program reading letters from Gov. Ted Kulongoski and former Gov. Neil Goldschmidt. "I would like to congratulate each and every one of you for your hard work and commitment to your team," Kulongoski wrote. "Having also been selected for the Sportsmanship Award shows just how special this team is. "You have made me and the state of Oregon very proud." Goldschmidt, now the president of the State Board of Higher Education, echoed Kulongoski. "Proud of you is the understatement of the year," Goldschmidt wrote. "That you are also recognized for sportsmanship made every Oregonian feel we had sent our best to do the very best. "You put Oregon on the map right where we want to be," he wrote. "Underdogs become champions again, reminding us that heart, discipline, effort and teamwork can overcome size and distance from big cities." Accolades have been pouring into OIT. Miles, who completed his 33rd season at the school and now has 734 career victories, has received almost 250 e-mails from former players, colleagues and others from around the country. Dow said she had received more than 200 e-mails and notes. "In the history of most people, something like this never happens," Dow said. "Together, OIT and the community are national champions." Mayor Todd Kellstrom then proclaimed Thursday "National Championship Day" in Klamath Falls. After Miles shared stories about each of his coaches, he introduced this year's redshirts, and then each of the 11 team members who played in the championship game of the NAIA Division II men's national tournament. The four captains, on behalf of their, thanked fans, family, teammates and coaches for the experience. "I am so scared to talk in front of so many people," said Florian Houguet, "but I want to thank OIT for the education I have received, the fans, Danny ... I mean Coach ... and my teammates." After signing numerous autographs, Houguet said: "I'm still shaking from everything. I'm in a zone. This is amazing. It is touching. It's wonderful to give the community something they deserve." Johnson said: "This last week we got to play before the most supportive and loud fans in the nation." "Having you fans coming to us and thanking us for the games we have played is a big thank you all alone," Todd Matthews said. "There is no better feeling than getting to bring this title to you guys. "Klamath Falls and OIT will always be a spectacular part of my life." The formal part of the celebration ended as the 11 players who went to Branson were presented, again, the national championship trophy with the theme song from "Rocky" blaring in the background. "Rocky" has been the theme song of this team from the outset. Dow spoke with the players before the parade and said she told them they were champions both as athletes and students. "I told them they have do so much good just being who they are," Dow said. "They are wonderful role models for our young people." There will be a special showing of the NAIA Division II championship game at 7 p.m. Monday, March 29, on Channel 3 by Klamath Community Television. The community access channel will also include a tape of Thursday's parade and the celebration at OIT.